An old fashioned, melt in your mouth Salted Almond Roca Recipe; almond roca from my grandmother with a little sea salt for a fresh flavor and modern taste. 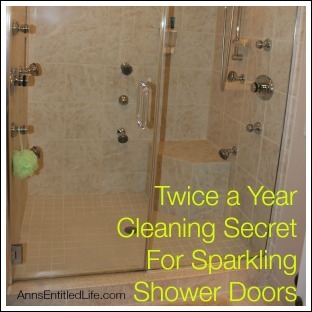 • Prepare a cookie sheet by spraying it with cooking spray and then laying a piece of waxed paper over it. • Start by toasting the almonds in a dry pan over medium high heat. Watch them carefully and stir constantly so they don’t burn. • In a large, heavy-bottomed cold pan and melt the butter over medium heat. • Add the corn syrup, water and sugar to the butter, and stir continuously until a candy thermometer reads 300 degrees and the candy is the color of a brown paper bag. • Note: If you want to be adventurous like my grandma, keep a glass of ice water handy and dip a spoon coated with candy into it. When the candy hardens to a crunchy, toffee texture, it’s ready. The thermometer is easier. 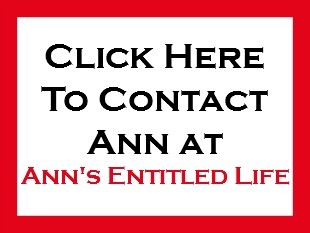 • Remove the pan from the heat and quickly stir in the almonds. You’re going to have move fast now, because the candy will thicken up and start to harden almost as soon as it’s out of the pan. Dump the candy onto the prepared pan and use a spatula to smooth it until it’s about half an inch thick. The candy won’t stick to the spatula because it’s mostly butter. • Break the chocolate into 3 pieces and lay it on top of the candy. Let it sit for three to five minutes until the chocolate melts. Spread to the edges of the toffee. Sprinkle sea salt over the chocolate. • Let the candy come to room temperature and then refrigerate for an hour so that the chocolate sets and the toffee hardens. Use a hammer or rolling pin to break into pieces. • One of my favorite holiday treats growing up was a dish of vanilla ice cream with little bits of my grandma’s Almond Rocha sprinkled over it. 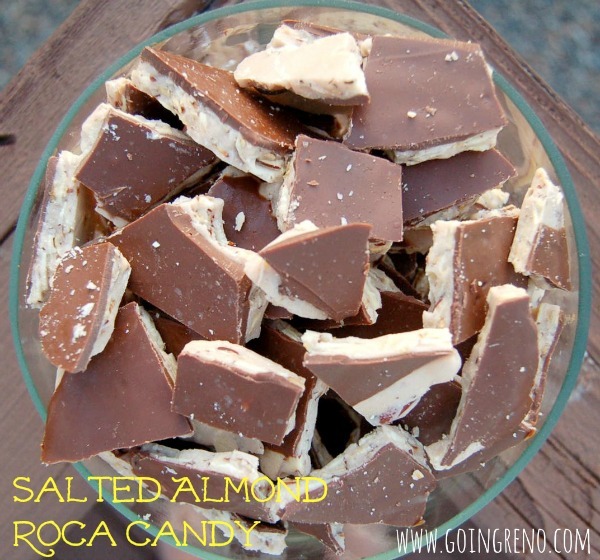 To print the Salted Almond Roca Candy Recipe , click here. Today is Day 3 of 15 Days of Holiday Sweets! 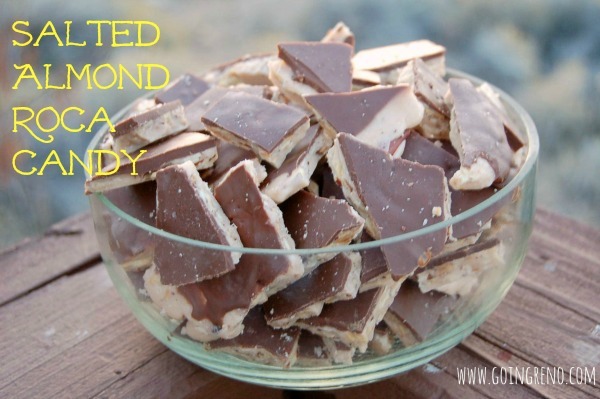 This Salted Almond Roca Candy Recipe is brought to you by Shaunta from Going Reno. 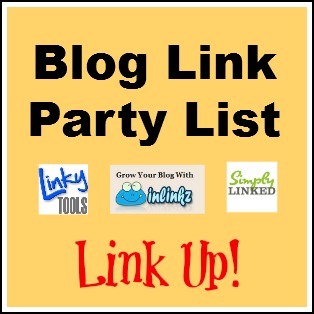 Shaunta Grimes writes young adult novels and blogs about being right brained at goingreno.com. She lives in Reno with her fabulous family and a pretty yellow rescue dog named Maybelline Scout. 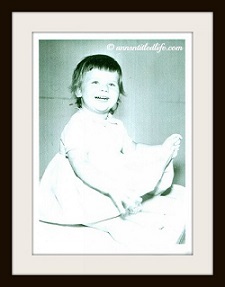 When I was a little girl, Christmas meant a lot of things of course. But one thing it meant, maybe a little bit more than anything else, was my grandma’s Almond Roca candy. She made it every year, and when I got old enough, I helped her. She didn’t use a thermometer—she kept a glass of ice water nearby and dipper her spoon into it to flash chill the candy and test it. The candy needed to be at the hard ball stage, crisp and crunchy. 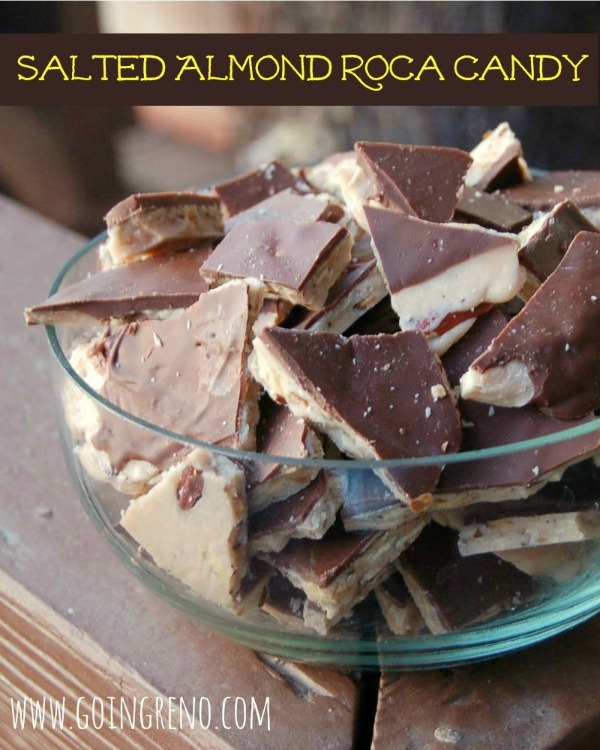 She called it Almond Roca when she gave it away, but when she was making it she always called it Paper Bag Candy, because the toffee was the color of a paper grocery page when it was done. I make Almond Roca with my girls every Christmas, with my own little twist. A little sea salt on the melted chocolate gives it a fresh flavor and a modern twist. 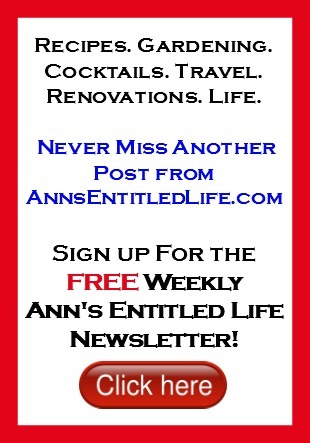 • If you enjoyed this post, be sure to sign up for the Ann’s Entitled Life weekly newsletter, and never miss another article! On confirmation, you will receive a link to the free eBook: A Baker’s Dozen of Holiday Sweets! 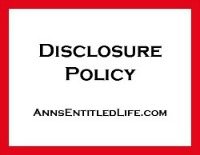 Offer available through New Year’s Day 2015 (1/1/15).